Futuba Yoshioka thought boys were loud and obnoxious in middle-school, but there was one boy, Kou Tanaka, who was a bit different. However, Futuba’s chance with Kou was dashed when he suddenly moved away, and she was crushed that nothing had even started. Years later in high school, will something start now that Futuba is reunited with a Kou who has changed as the time passed? 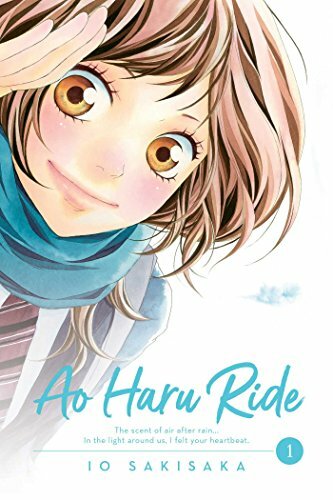 Ao Haru Ride is a series I’ve been waiting for a long time to see in English, and years after its anime adaption and international release in other languages it is here and it was definitely worth the wait. 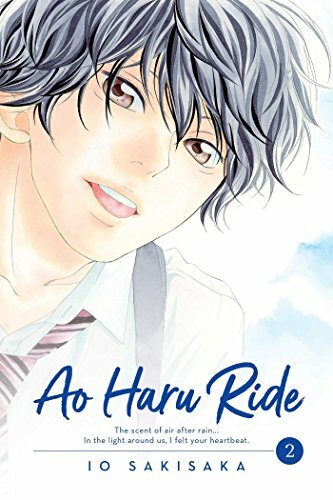 Ao Haru Ride Vol. 1, like creator Io Sakisaka’s previous fantastic series Strobe Edge, expertly does one of the most difficult things for a slice-of-life romance series to do in walking the line between conveying the exciting and charmingly idealized aspects of the romantic experience while also avoiding being too gratuitous. The result, particularly in this first volume, is a story that depicts Futaba’s experience coping with the changes brought about by the passing of time with a certain care that conveys the impact of it all on her perspective towards how she acts and lives her life. 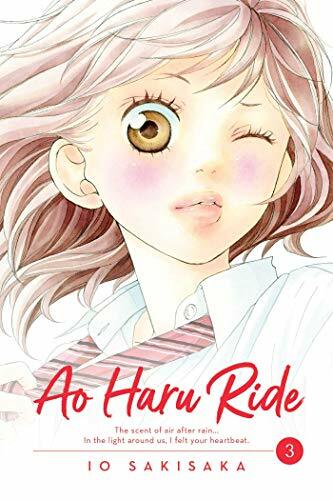 The set-up provided to Ao Haru Ride’s story in this volume demonstrates Sakisaka’s deft touch in illustrating the feelings of the characters she creates. The story begins quite effectively via prologue showing a snippet of Futuba’s middle-school life and her process of beginning to develop feelings for Kou before having them dashed due to a misunderstanding. It’s refreshing how muted this all is – the events feel like something that might actually happen in real life as opposed to the dramatics that are present in some other series, making Futuba’s experience all the more relatable. The result is that when Futuba tells us she’s crushed by what happens, we believe it, and this gives a poignant background that the series builds upon as the volume begins Futaba’s high school years. The remainder of the volume follows Futaba as she finishes her first year of high school and begins her second, and I was roundly pleased with the way that the story conveys a sense of hope breaking the melancholy of missed opportunities as Futaba reunites with Kou. Sakisaka does a great job illustrating the effect that Futaba’s experiences shape the way she conducts herself, and this is challenged nicely by Kou’s arrival in Futaba’s life. The issues that Futaba faces, such as dealing with friends who may not have her best interests at heart, all feel real to the high school experience, and I enjoyed the way that her character develops little bit little even over the course of this first volume. One of the main themes in this volume is the way that people change over time, and it’s a treat to see a story skillfully handle the tension between being true to oneself versus being reactively shaped by one’s life experiences. Futaba and Kou’s current selves, even in this early going, are challenged by the presence of someone who paid attention to their past selves, and I’m eager to see the way that this leads to the development of both of these characters. An example of this is Futuaba trying to reconcile the quiet “Kou Tanaka” she knew with the dour “Kou Mabuchi” that she’s now presented with, and I enjoyed the way that we saw her realize just how much things can change while also becoming determined to try to find the Kou that she once knew in her interactions with him. I’ve been a fan of Io Sakiska’s art since I read Strobe Edge, and I’m pleased to say that her art conveys the same subtle cinematic sense that draws out the dramatic aspects of scenes without ever feeling to gratuitous. A simple framing of a character’s face becomes a storytelling tool in a way that I see few other series accomplish, and this ends up being an effective use of showing the reader as opposed to telling them. The best example of this is a scene mid-way through chapter 1 where Futaba and Kou reunite under the rain at their local shrine once again. The scene culminates as Kou plays dumb when faced with Futaba’s questions about his identity before finally confirming who he is with a line that was special to them. This scene truly stands out for the way that Futaba is depicted processing the information against the backdrop of the evening sun while Kou turns his head in a knowing smile. The framing of this scene is perfect in capturing the scenery as well as giving this simple event a dramatic flair to portray the way the scene must feel to Futaba. I can honestly say that I’d buy this volume for that scene alone, and it’s a real treat to have a whole lot more of Sakisaka’s work coming to enjoy. Ao Haru Ride Vol. 1 is a strong read that fans of slice of life romance series need to be picking up. 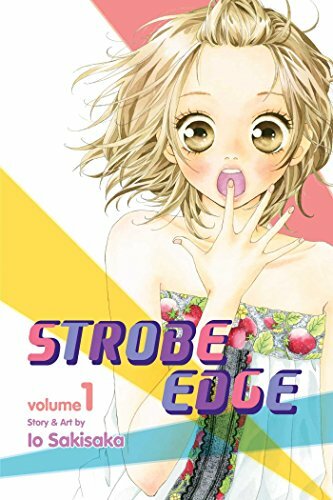 Strobe Edge was an essential read for the way it carefully fleshed out the romantic experiences of its protagonist, and Ao Haru Ride is shaping up to be no different because of the grounded yet thematically rich storytelling presented. Sakisaka’s art is also great and helps to elevate the proceeding to give a flair for the dramatic that never veers into gratuitousness. Pick this one up right away! Ao Haru Ride Vol. 1 was translated by Emi Louie-Nishikawa and published Viz Media on October 2, 2018. Created by Io Sakisaka, the series ran in Shueisha’s Besatsu Margaret magazine and concluded in 13 volumes in 2015.